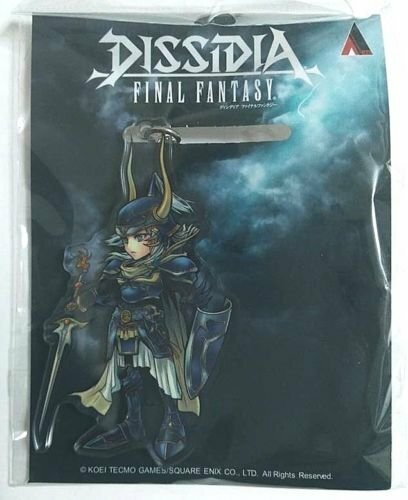 This package comes in 100 pcs of high acrylic keyring with insert size of 25x25mm (approx. 0.98 x 0.98 inches). Each keyring comes in 2 parts, a larger base attached to a split ring & a front cover to snap on to the base. Each keyring accommodates a square shaped insert up to a size 25 x 25mm (approx. 0.98 x 0.98 inches) and every keyring is packed in an individual polybag to avoid any scratches. You can create your own inserts with your own personal logos, pictures or artworks. Just cut out an insert with the correct size, put it into the base part, and then snap on the front cover to create your own finished product. These low cost and high quality items are ideal for promotion and fundraising events, such as public gatherings, birthdays and other festivities likewise. Any insert, photo or illustration shown in the pictures are for demonstration purpose only and not included in the offer. 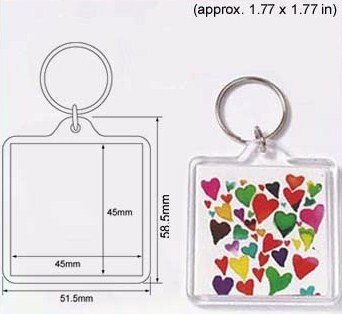 This package comes in 100 pcs of high acrylic keyring with insert size of 45x45mm. Each keyring comes in 2 parts, a larger base attached to a split ring & a front cover to snap on to the base. 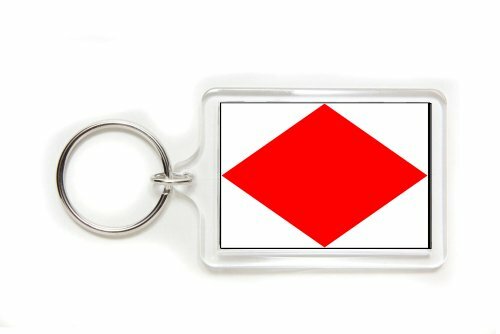 Each keyring accommodates a square shaped insert up to a size 45 x 45mm (approx. 1.77 x 1.77 inches) and every keyring is packed in an individual polybag to avoid any scratches. You can create your own inserts with your own personal logos, pictures or artworks. Just cut out an insert with the correct size, put it into the base part, and then snap on the front cover to create your own finished product. These low cost and high quality items are ideal for promotion and fundraising events, such as public gatherings, birthdays and other festivities likewise. Any insert, photo or illustration shown in the pictures are for demonstration purpose only and not included in the offer. 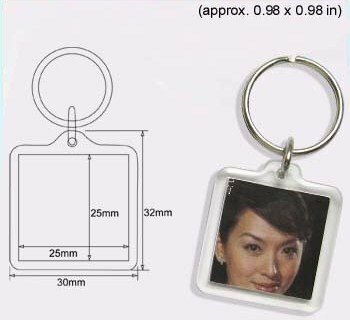 This package comes in 100 pcs of high acrylic keyring with insert size of 25x25mm. Each keyring comes in 2 parts, a larger base attached to a split ring & a front cover to snap on to the base. Each keyring accommodates a square shaped insert up to a size 25 x 25mm (approx. 0.98 x 0.98 inches) and every keyring is packed in an individual polybag to avoid any scratches. You can create your own inserts with your own personal logos, pictures or artworks. Just cut out an insert with the correct size, put it into the base part, and then snap on the front cover to create your own finished product. These low cost and high quality items are ideal for promotion and fundraising events, such as public gatherings, birthdays and other festivities likewise. Any insert, photo or illustration shown in the pictures are for demonstration purpose only and not included in the offer. 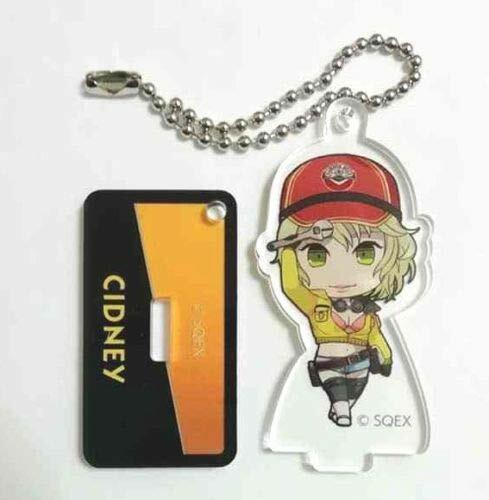 This package comes in 50 pcs of high acrylic keyring with insert size of 45x45mm. Each keyring comes in 2 parts, a larger base attached to a split ring & a front cover to snap on to the base. Each keyring accommodates a square shaped insert up to a size 45 x 45mm (approx. 1.77 x 1.77 inches) and every keyring is packed in an individual polybag to avoid any scratches. You can create your own inserts with your own personal logos, pictures or artworks. Just cut out an insert with the correct size, put it into the base part, and then snap on the front cover to create your own finished product. These low cost and high quality items are ideal for promotion and fundraising events, such as public gatherings, birthdays and other festivities likewise. Any insert, photo or illustration shown in the pictures are for demonstration purpose only and not included in the offer. 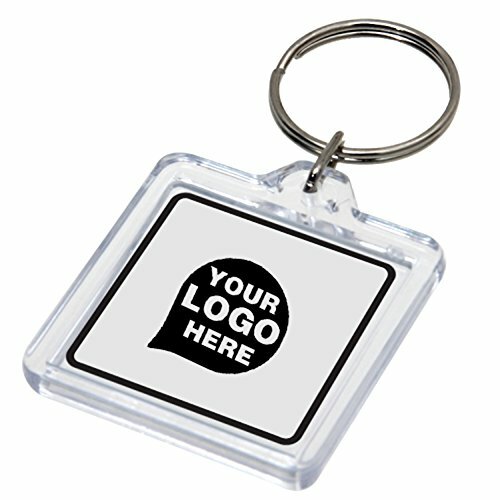 This Square Shaped Acrylic Key Chain Promotional Product Made From Acrylic. Custom & Personalized Wholesale Products. Product Size: 2.87 x 1.56 x 0.19 Inch. 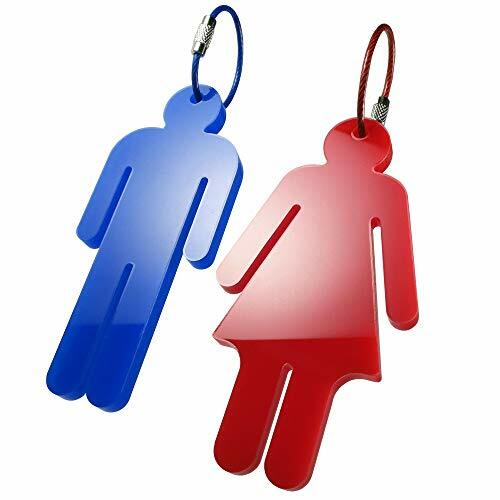 Your Bundle Includes: 1 x Men's Acrylic Restroom Key Tag 1 x Women's Acrylic Restroom Key Tag 1 x Blue Plastic Coated Stainless Steel Wire Keyring 1 x Red Plastic Coated Stainless Steel Wire Keyring 2 x Nickel Keyrings Product Specifications: Men's Tag: 4" x 1-11/16" Women's Tag: 4" x 2-1/16" Tag Thickness: 7/32" (a little under 1/4") Stainless Steel Wire Keyring: Approx 4" (unhooked) Nickel Keyring: 1" diameter 100% Money Back Guarantee If for any reason you aren't happy with your purchase, let us know and we'll replace or refund your order - no questions asked! 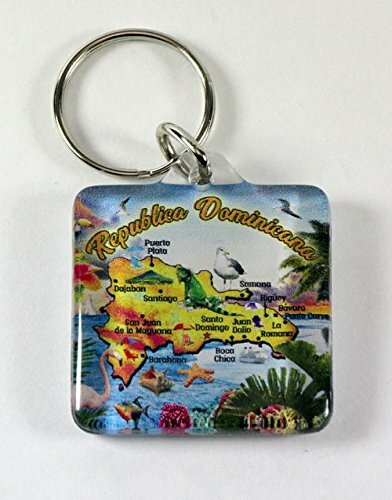 Here's a brand new, rare and a hard to find collector's item: Dominican Republic MAP ACRYLIC SQUARE KEYCHAIN 1.5"X 1.5". 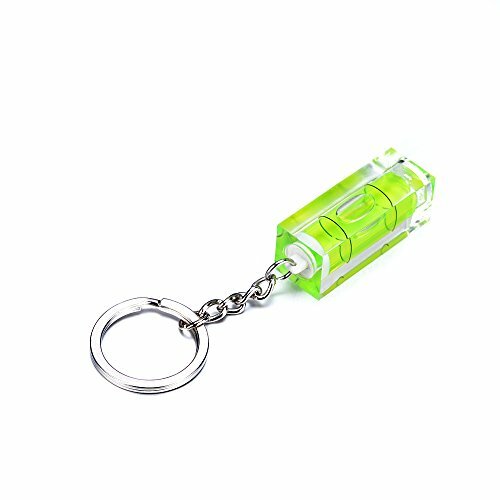 These keychains are made of industrial strength acrylic and are neither flexible nor bendable. They are also water resistant but not waterproof and it's not advisable to keep them in water for prolonged periods of time. 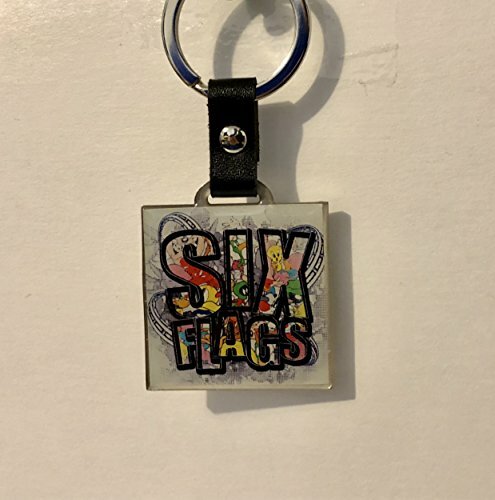 These keychains are standard full color and not 3D (tri-dimensional). Design is on front side. Back side is white/blank. Included and attached is a key loop. 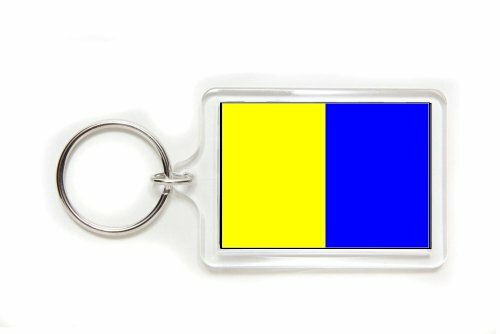 Dimensions of the key chain fob are 1.5" length x 1.5" width. These are all extremely rare and would make a wonderful addition to anyone's collection or make a great gift! 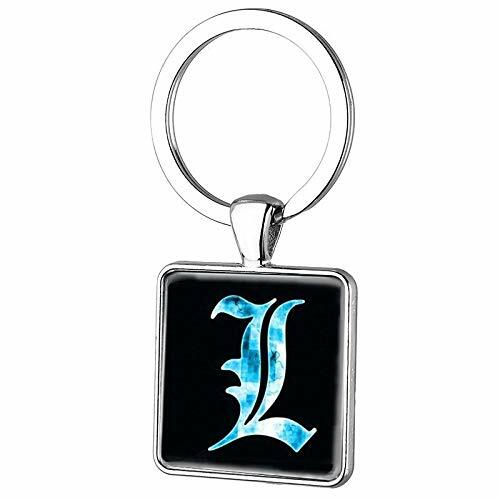 01pcs of Double Sided Anime Death Note Black Book Keychain Size: 5.5CM - 11CM (including keyring). Thick: 3MM - Clear Acrylic with protective film Fantastic Prints Gift for All fans of Anime. Perfect companion with you on the go to anywhere you want to proudly display your love Please Note: It usually takes 12-20 days for item to arrive in US territory Any problem? Send us Messages! ☘ Momoso Store is online round a day. Come and Get 01 NOW! Popular Gift Collectible New York Landmarks Photo Keychains!! 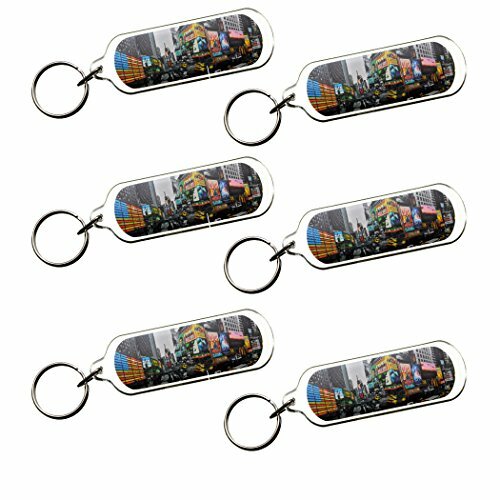 This is Ultimate Collectible New York City Photo theme Keychains! Best for NYC Souvenir or Gift. You can insert small labels into the plastic holder, is convenient to distinguish the room keys.Built in a metal split ring, is convenient to hang on your keychain.For CALIFORNIA residents only: WARNING: This product contains chemicals including DEHP, which is known to the State of California to cause cancer and birth defects or other reproductive harm.Please note that by posting this Proposition 65 warning, we are notifying you that one or more of the Proposition 65 listed chemicals may be present in a product. With Unique Bargains' products, the exposure to these chemicals may be of no significant risk to you, but out of caution, we have elected to place this warning on our site to make sure our customers are informed.You can find more infomation at http://www.oehha.ca.gov/proposition-65/about-proposition-65. The key tag is made from a colourful plastic, complete with paper insert protected by a clear plastic cover and coiled ring.This ID Label Key Chain with Ring is one of many top quality items in our Key Chains department.For CALIFORNIA residents only: WARNING: This product contains chemicals including DEHP, which is known to the State of California to cause cancer and birth defects or other reproductive harm.Please note that by posting this Proposition 65 warning, we are notifying you that one or more of the Proposition 65 listed chemicals may be present in a product. With Unique Bargains' products, the exposure to these chemicals may be of no significant risk to you, but out of caution, we have elected to place this warning on our site to make sure our customers are informed.You can find more infomation at http://www.oehha.ca.gov/proposition-65/about-proposition-65. These Extra Color-Coded Key Tags for a Key Tag Rack make it easy to keep track of your keys. Bright colors and lightweight, durable plastic make the Extra Color-Coded Key Tags a great choice for your organizational needs. Alabama Crimson Tide NCAA Acrylic Key ChainNCAA Acrylic Double Sided Key Chain1.5" x 2.5"
West Virginia Mountaineers NCAA Acrylic Key ChainNCAA Acrylic Double Sided Key Chain1.5" x 2.5"
Iowa Hawkeyes NCAA Acrylic Key ChainNCAA Acrylic Double Sided Key Chain1.5" x 2.5"
Florida Gators NCAA Acrylic Key ChainNCAA Acrylic Double Sided Key Chain1.5" x 2.5"
Oregon Ducks NCAA Acrylic Key ChainNCAA Acrylic Double Sided Key Chain1.5" x 2.5"
Penn State Nittany Lions NCAA Acrylic Key ChainNCAA Acrylic Double Sided Key Chain1.5" x 2.5"
Nebraska Cornhuskers NCAA Acrylic Key ChainNCAA Acrylic Double Sided Key Chain1.5" x 2.5"
Michigan State Spartans NCAA Acrylic Key ChainNCAA Acrylic Double Sided Key Chain1.5" x 2.5"